a. Why is Strom Plumbing By Sign of the Crab the most respected name in plumbing fixtures? 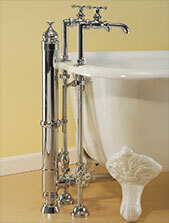 Our leg tub faucets are faithful reproductions of antique originals. Our British Telephone Series have Swing Arm Couplers installed for variable centers. All other faucets with standard inlet assemblies have 3-3/8″ centers. All handheld shower units with hoses come with a vacuum breaker as part of the set. b. What is the difference between quarter turn ceramic valves and compression valves. For years the plumbing industry used a stem with threads and a bib washer on the end of the stem. The disadvantage was that the washers would wear out and would have to be replaced or the valve could be ruined. The new stems used in our faucets use 2 ceramic discs that rotate when the stem turns, allowing the water to flow or shut off. The wear on these discs is so minimal that the valve cartridge can last for many years. c. How do I determine what type of faucet I need for my tub? The real advantage of using Strom faucets is that the choices are almost unlimited. 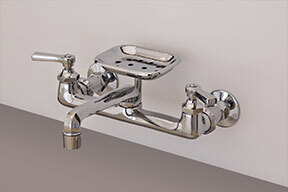 Use deck mount faucets if the fixture is going onto a horizontal surface and use a wall mount style if the tub wall or the wall itself is going to be used. d. How are the faucets made? 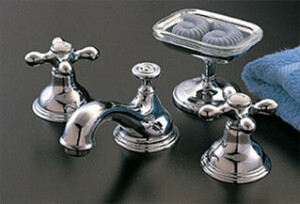 Strom Plumbing faucets are all made of solid brass. The are formed by using either a sand cast mold or by forging in steel molds. Since many of our faucets are the standards of the industry, we have invested in the steel molds to produce the finest and most delineated designs available today. Not only is there a consistent thickness to each faucet wall, but the designs remain clear and distinct even after polishing because of this process. Once the faucet is fashioned, it is machined using the best equipment on the market today to insure threading compatibility with the industry. e. What finish is the best? Finish is entirely a matter of taste. Without a doubt, the most durable finish is chrome plated solid brass. It is impervious to various cleaning methods, and will hold up for many, many years. It is still the number one choice of all finishes on the market today for that reason. f. Why is there no warranty on the oil rubbed bronze finish? This finish is one of the finest in the industry, but it is not a “living finish” as so many others advertise. It is a solid color that is applied directly to the brass, and each & every piece is inspected at each step. When the faucet or tub is assembled, and before it is shipped, it is inspected again before going into special protective covers. That is why when you receive it, it should be inspected by you before installation. When your professional installs it, they should use the proper tools to prevent any scratches or imperfection from occurring. By simply wiping with a soft cloth after use, this finish will last for many, many years. g. How can we get a true thermostatic faucet that meets the code in most states? There may be some resistance to this setup by inspectors due to the fact that the spout is below the lip of the tub. We have incorporated anti-siphon devices into the design of the faucet. a. What’s the best way to install your products? There really is only one way to install our products, and that is with a qualified, licensed plumber. It is the only way to keep the warranty intact. b. What are the centers for the P0398S? The centers on the P0398 supply sets are the same as the faucet that is being installed. For example, if used with a 3 3/8″ faucet, the centers will be 3 3/8″. If a faucet like our P0146 with 7″ centers is used, then the rough-in for the P0398 will be 7″. c. How do you install our P0007E Waste and Overflow? The rough-in for the drain hole on the floor is a plumb line from the center of the roll rim on the tub to the floor. Rough-in 1 1/2″ male IPS with 1/2″ above the finished floor. All tubing is 1 1/2″. d. How do you install our P0342 Supply Sets? For all supplies, place the faucet washer on the end of the supply and use the flange as a friction ring. Rough in 1/2″ IPS with 1 1/2″ of threads above the finished floor. The P0342 set uses 8″ centers on the floor. e. What about the slant on the tubs? This is very common occurrence and Strom Plumbing came up with a solution to this problem years ago. Please see our installation instructions for our shower enclosures.